Hallmarked By : Assay Office London. Round Diamond Full Eternity Ring. Setting Type : Claw set. Setting Type : Claw Setting. Hatton Garden Jewellery Quarter, London. Center Diamond Shape : Round Brillant. 9ct Yellow Gold. Ring is UK Hallmarked for solid 9ct Gold. Diamond Ring. Size S (uk) - 9 1/8 ( usa) Ring sizing details Below . Ring sizing service available, at cost price of £19.50. Set with 0.10ct of sparkling round cut diamonds. 9ct White Gold. Ring is UK Hallmarked for solid 9ct Gold. Diamond Ring. Size R (uk) - 8 5/8 ( usa) Ring sizing details Below . Ring sizing service available, at cost price of £23.50. Set with 0.05ct of round cut diamonds. 9ct White Gold. Ring is UK Hallmarked for solid 9ct Gold. Diamond Ring. Size O (uk) - 7 ( usa) Ring sizing details Below . Ring sizing service available, at cost price of £23.50. -Established family run jewellers with over 12 years of Experience. 9ct Yellow Gold. Ring is UK Hallmarked for solid 9ct Gold. Diamond Ring. Size P (uk) - 7 1/2 ( usa) Ring sizing details Below . Ring sizing service available, at cost price of £19.50. Set with 0.25ct of sparkling round cut diamonds. 9ct White & Rose Gold 0.17ct. Ring is UK Hallmarked for solid 9ct Gold. Diamond ring. Size Q (uk) - 8 ( usa) Ring sizing details Below . Ring sizing service available, at cost price of £23.50. -Established family run jewellers with over 12 years of Experience. 9ct White gold. Ring has full UK Hallmarks for solid 9ct Gold. Diamond ring. -Established family run jewellers with over 12 years of Experience. Total Weight (grams) - 2.8. Size N (uk) - 6 1/2 ( usa). 9ct Yellow Gold. Ring is UK Hallmarked for solid 9ct Gold. Diamond Ring. Size L (uk) - 5 1/2 ( usa) Ring sizing details Below . Ring sizing service available, at cost price of £19.50. -Established family run jewellers with over 12 years of Experience. 9ct Yellow Gold. Ring is UK Hallmarked for solid 9ct Gold. Diamond Ring. Size N (uk) - 6 1/2 ( usa) Ring sizing details Below . Ring sizing service available, at cost price of £19.50. -Established family run jewellers with over 12 years of Experience. 9ct Yellow gold. Ring is UK Hallmarked for solid 9ct Gold. Diamond ring. Size S (uk) - 9 1/8 ( usa) Ring sizing details Below . Ring sizing service available, at cost price of £20.00. -Established family run jewellers with over 12 years of Experience. 9ct Yellow gold. Ring is UK Hallmarked for solid 9ct Gold. Diamond ring. Size N (uk) - 6 1/2 ( usa) Ring sizing details Below . Ring sizing service available, at cost price of £20.00. Set with 0.25ct of sparkling round cut diamonds. 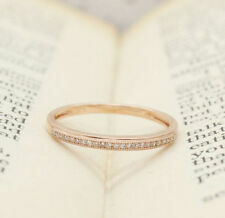 A 22ct GOLD DIAMOND HALF ETERNITY RING, EB167. Hallmarked for Birmingham 1926 and 22ct gold. The plain shank set with nine single cut diamonds, estimated total diamond weight 0.30ct. A very pretty ring. Solid Platinum 950. Ring is UK Hallmarked for solid 950 Platinum. Diamond ring. Size H (uk) - 4 ( usa) Ring sizing Available. -Established family run jewellers with over 12 years of Experience. Total Weight (grams) - 3.8. This is a beautiful solid 18ct yellow gold eternity ring set with 0.50ct of chanel set diamonds. The stones are clear and very sparkly and full of fire, they are colourless and virtually Flawless diamonds. You don’t see many 10ct rings as the majority are often 9ct or 18ct. The diamonds have been tested and it is hallmarked 375 for 9ct & 10kt Gold. There are 18 small round cut ice diamonds in a yellow gold mount. The round cut diamonds are evenly spaced and set flush into a White gold mount (see pictures). The stones have a fantastic sparkle and lustre and really look stunning. The photos do not do it justice. Hallmarked By: Assay Office London. Round Diamond Full Eternity Ring. Setting Type : Claw Setting. Hatton Garden Jewellery Quarter, London. Diamond Shape : Round Brilliant. This ring is also available in Platinum, 18K White, Yellow and Rose Gold. 9ct White Gold. Ring is UK Hallmarked for solid 9ct Gold. Diamond Ring. Size N (uk) - 6 1/2 ( usa) Ring sizing details Below . Ring sizing service available, at cost price of £23.50. Set with 0.10ct of round cut diamonds. 9ct Gold 0.50ct. Ring has full UK Hallmarks for solid 9ct Gold. Diamond ring. Size M (uk) - 6 ( usa) Ring sizing details Below . Ring sizing service available, at cost price of £18.00. Ring sizing is done to a very high standard. This Is An Exceptional Eternity/Wedding Ring In 18ct Heavy Yellow Gold,The Total Weight Is Approx (5.3)grams.It Has Seven White, Clear, Princess Cut Diamonds.It Is In Very Good Condition And Is A Size S.
9ct Yellow gold. Ring is UK Hallmarked for solid 9ct Gold. Diamond ring. Size M (uk) - 6 ( usa) Ring sizing details Below . Ring sizing service available, at cost price of £20.00. -Established family run jewellers with over 12 years of Experience. 9ct White Gold. Ring is UK Hallmarked for solid 9ct Gold. Diamond Ring. Size N (uk) - 6 1/2 ( usa) Ring sizing details Below . Ring sizing service available, at cost price of £23.50. -Established family run jewellers with over 12 years of Experience. Hallmarked By: Assay Office London. Round Diamond Full Eternity Ring. Setting Type : Claw set. Hatton Garden Jewellery Quarter, London. Center Diamond Shape : Round Brillant. Side Diamond Shape : Round Brilliant. Main stone : Diamond Style : Full Eternity. Occasion : Anniversary Total carat weight : 1.00 Carat. Diamond Education. Width : 2.7 mm Main stone shape : Round Brilliant. Diamonds color : F Cut : Very good. Baguette Diamond Full Eternity Ring. Diamond Shape : Baguette Setting Type : Channel Setting. Diamond Clarity : SI Hallmarked By :Assay Office London. Hatton Garden Jewellery Quarter, London. Diamond Weight : 1.00 Carat Ring Size : L, M.
9ct Yellow gold. Ring is UK Hallmarked for solid 9ct Gold. Diamond ring. Size K (uk) - 5 1/8 ( usa) Ring sizing details Below . Ring sizing service available, at cost price of £20.00. Set with 0.25ct of sparkling round cut diamonds. Round Diamond Full Eternity Ring. Diamond Shape : Round Brilliant Setting Type : French Pave Set. Hatton Garden Jewellery Quarter. -This ring is also available in Platinum, 18K White, Yellow and Rose Gold. 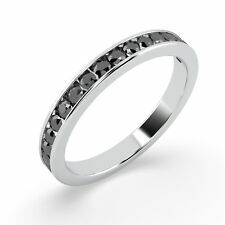 Round Diamond Half Eternity Ring. Hatton Garden Jewellery Quarter, London. This ring is also available in Platinum, 18K White, Yellow and Rose Gold. DIAMOND JEWELLERY. Diamond Cut : Excellent. Diamond Color : F-G.
Can be resized if needed at a jewellers. 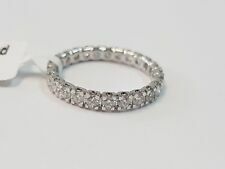 2mm Thin Round Diamond Eternity Ring. Diamond Clarity : VS Hallmarked By :Assay Office London. Diamond Shape : Round Brilliant Setting Type : Micro Pave Setting. Hatton Garden Jewellery Quarter, London. 9ct White gold. Ring is UK Hallmarked for solid 9ct Gold. Diamond ring. Size O (uk) - 7 ( usa) Ring sizing details Below . Ring sizing service available, at cost price of £25.00. -Established family run jewellers with over 12 years of Experience. Hallmarked By : Assay Office London. Round Diamond Full Eternity Ring. Setting Type : Claw set. Hatton Garden Jewellery Quarter, London. Center Diamond Shape : Round Brillant. This ring is also available in Platinum, 18K White, Yellow and Rose Gold. It is a lovely design with the diamonds set in a beautiful vine like setting in luscious rose gold, and weighs 2.7 grams. The ring is 6 mm across, and sits 3 mm tall. The ring is hallmarked for 9 carat gold. 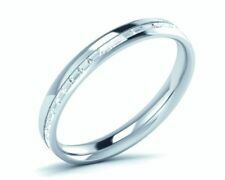 Tapper Baguette Diamond Full Eternity Ring. Diamond Shape : Tapper Baguette Setting Type : Channel Setting. Hatton Garden Jewellery Quarter, London. Diamond Clarity : VS Hallmarked By :Assay Office London. 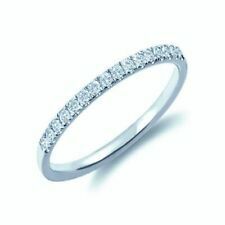 18ct White Gold 1.22ct Princess Cut Diamond Eternity Ring. Goldmine Jewellers. 18ct White Gold 1.22ct Princess Cut Diamond Eternity Ring. Goldmine Jewellers London. Set With 1.22ct of Princess Cut Diamonds. Diamond Colour H Clarity SI1. Ring Size N. Weight 3.6 Grams. Setting Width 3.5mm. Solid Platinum 950 Opal &. Diamond ring. Size P (uk) - 7 1/2 ( usa) Ring sizing Available. All stones have been tested to confirm they are natural. -Established family run jewellers with over 12 years of Experience. Setting Type : Pave Set Style : Twisted. Occasion : Anniversary Total carat weight : 0. Diamond Education. Ring Size Chart. Main Stone : Round Brilliant Ring Size : H,I,J,K,L,M,N,O,P,Q,R,S. This ring is also available in following sizes H, H½, I, I½, J, J½, K, K½, L, L½, M, M½, N, N½, O, O½, P, P½, Q, Q½, R, R½, S, S½. Brand-new 18ct white and yellow gold ring set with 52 E-F VVS round-cut diamonds (total 2 ct) in double-row full-eternity style. This Half Eternity Ring is in great condition. Light signs of use can be seen but under close inspection only. All 7 diamonds are held in place perfectly whilst showing no signs of looseness and adding to a total of 0.35ct. Diamond Carat : 2.00 Carat Ring Size :K, L, M, N, O. Diamond Shape : Princess Setting Type : Channel Setting. Hatton Garden Jewellery Quarter, London. This ring is also available in Platinum, 18K White, Yellow and Rose Gold. 18ct Yellow Gold Diamond Ring. 0.33ct Diamond Weight is marked on the inside of the ring. -Established family run jewellers with over 12 years of Experience. Set with 0.33ct of beautiful round cut diamonds.